I’m baaack! We had a fabulous time in the Caribbean, and I’m finding it kind of difficult to get back into my regular routine. Now check this place out. It was built in the 1990s as a basic “spec house” in Manchester-by-the-Sea, Massachusetts, without much character or distinguishing style. But after a thorough and thoughtful renovation, it was given the “sea-cottage aesthetic” of a classic shingle-style home. The existing house was spec-built in the early 1990’s to a basic level of finish. C&M architects and builders worked with the homeowners to reveal the potential beyond, starting with detailed custom interior build outs, including a paneled library, custom kitchen and butler’s pantry, two unique fireplace surrounds, a pair of classically detailed dining room china cabinets and a fully paneled entry hall with hidden closet. Designer John De Bastiana kept things classic with blue and white. Beautiful! The architect was Michael T. Gray and the builder was Don Tison. Photography by Sam Gray. For more information, visit Carpenter & MacNeille, designer John De Bastiani, and New England Home. Wow. I think this is my dream house. Gorgeous! Stunning! I love the onion-style light fixtures on the porch ceiling. I have been wanting to get something similar for our porch, because in my mind, our (Illinois) house is actually in New England! Did everybody see the movie Manchester By The Sea? Depressing but excellent; I am a big fan of Michelle Williams. This is one of my favorite homes! I am loving all the blue! Such a stunning home! I am in love. 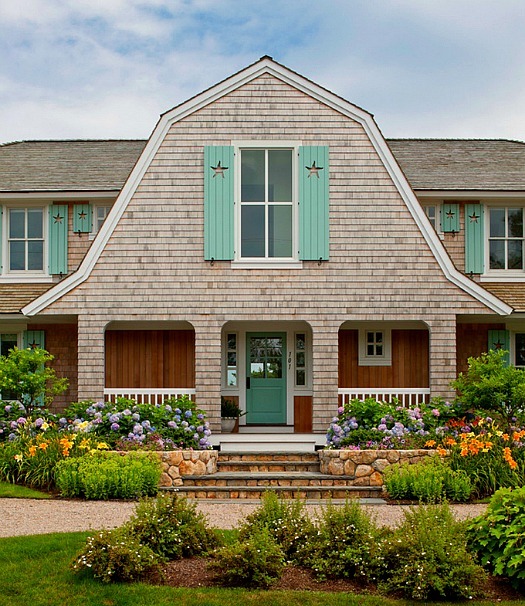 Shingle style always makes me swoon. The execution of this house is just exquisite. I love that they used so many special, lovely wallpapers!!! A lovely house of watery blues. The kitchen is classic perfection. Beautiful! It’s exactly what I picture when I think of New England homes. What a fantastic home. I love the blue & white color scheme used throughout the home. But the dining room wallpaper- amazing!!! Thanks for sharing! I love the houses you show,you have beautiful houses in America.